The robust towers of the castle of Santa Severa. Santa Severa castle was started in the 9th Century by Pope Leo X. Successive popes added to it and it reached its current form in the 15th Century. In 1482, pope Sixtus IV gave it to the Order of the Holy Spirit, a religious group, who owned the castle until 1980. It’s now a museum. Santa Severa looks like a giant sandcastle. Behind the castle is a village, built on top of an ancient Roman settlement, and still enclosed within a square wall. The base of the wall is clearly of ancient Roman construction. Scattered around the main square, once the town forum, are remains of temples and inscriptions from the ancient past. Inside the walled village. A mix of ancient and medieval. The ancient Roman settlement, in turn, was built on top of the Etruscan port of Pyrgi. Founded in the 7th Century BC, this was one of the most important ports in the whole of Etruria. It was very close to Caere (modern Cerveteri) and Tarquinia, Etruscan towns now famous for their stunning necropoli (tomb complexes). In 1964, during excavations at Pyrgi, three gold tablets were discovered containing bilingual texts in Phoenician and Etruscan. They have helped to decipher more of the still relatively unknown Etruscan language. Dating to the about the 6th Century BC, they also contain one of the oldest examples of written language by an Italian people. Today you can admire them in the Villa Giulia museum in Rome. 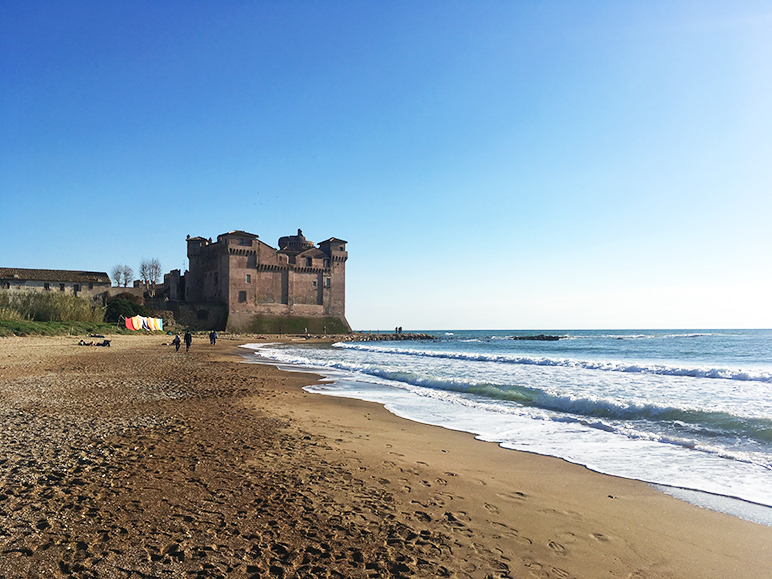 Walking along the beach at Santa Severa, and enjoying the views of the castle, is a delight even in winter. Yesterday (November 10), thanks perhaps to Saint Martin’s summer, it was beautifully sunny with temperatures of about 20 degrees Celsius (68 degrees Fahrenheit). One or two plucky people were sunbathing and swimming in the sea. Anyone who has enjoyed the recent anglo-Italian TV series Medici: Masters of Florence—starring Dustin Hoffman—will have seen the castle in the very first episode. Look out for it in the trailer here. If you’re hungry, there’s also a pretty good seafood restaurant, L’isola del Pescatore, with views of the castle. The atmosphere is very summery, with its blue wooden chairs reminiscent of the kind of Greek island made famous through Mamma Mia! A restaurant with a view: l’isola del pescatore. We went for the classic spaghetti alle vongole (spaghetti with clams) and a more unusual fettucine con polpo e pecorino (fettucine with octopus and pecorino cheese). This was original, because according the ‘rules’ of Italian cuisine, you don’t put cheese on pasta made with seafood. But this worked incredibly well. The octopus, cut into small pieces, was as fresh and tender as could be and the sauce was warm with a slightly piccante edge. The clams were also excellent. We couldn’t help feeling however, that the spaghetti were a little undercooked (even by Italian standards) and the homemade fettucine a little too thick, which resulted in them being a bit mushy. But this is picky. The dishes were excellent and I’d definitely eat here again. Fettuccine con polpo e pecorino. After the pasta we went for a classic fritto misto (mixed seafood fried in batter). Again, the fish, calamari, moscardini, and mazzancolle, (squid, baby octopus, and king prawns) was fresh and tasty. Just as it should be. The service was quick and the staff were very friendly. This was surprising as there were two large groups in the restaurant but this didn’t faze the staff or reduce the quality of their service. It’s a little pricey. A primo, secondo, and dolce, with house wine will set you back about €60 a head. But for the location, the food, and the service, I’d say it’s worth it. L’isola del pescatore,Via Cartagine 1, 00058 Santa Severa, Lazio, Italy. Open Thursday-Tuesday 12.30-15.00. Also Saturday 20.00–22.00.